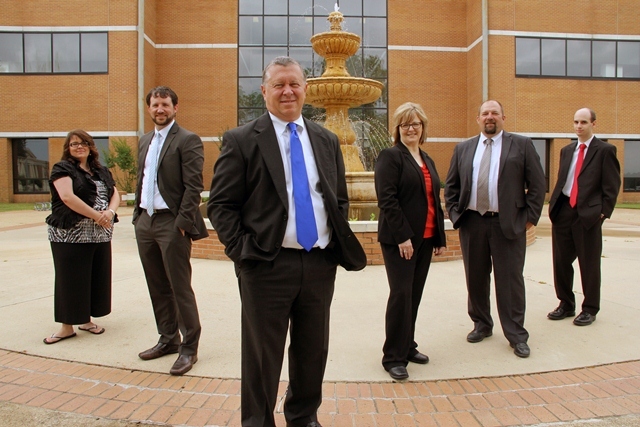 Mustard Seed Financial is headed up by Dr. David Ashby, third from left, and employs current SAU student Jen Milam, left, and SAU College of Business alumni, from left, Jonathan Baird, Angela Eaves, Bruce Butterfield, and Zach Talley. Dr. David Ashby became interested in finance early. He was inspired by watching people and their spending habits, noting how some high income families managed to spend all their money while others on more modest incomes were able to accumulate comfortable nest eggs that would allow them to retire comfortably. He was influenced by his grandparents’ habits, who lived through the Great Depression, and his parents who raised six children on his father’s income. Going into college, the Arkansas High School graduate looked to the accounting program at SAU to launch his intended pursuit, unaware that the field of finance even existed. He graduated from SAU in 1977 with the seed of interest in finance firmly planted by his professor, Dr. David Rankin, and that seed continued to grow. Ashby spent 14 years working as an accountant. But after teaching night classes for several years in Fort Smith, he decided he wanted to teach finance as a career. Ashby earned his doctorate in finance (1996), became a Certified Financial Planner™ professional (CFP®) in 1997, and launched the first financial planning curriculum in Arkansas. He holds the Peoples Bank Professor of Finance endowment at SAU, and was awarded the 2012 Honor Professor designation by his peers. Along with former student Darla Williams (SAU 1999), Ashby co-founded Mustard Seed Financial, LLC, a fee-only advisory firm in 2002. Much like the way his interest in finance bloomed at SAU, the firm has grown to manage approximately $150 million in assets. Mustard Seed is staffed by alumni from the renowned and respected SAU College of Business. Growing up in Waldo, Jonathan Baird (SAU 2001 and 2010) had a similar intrigue with watching how people spent their money. His parents and grandparents taught him early how to save money. 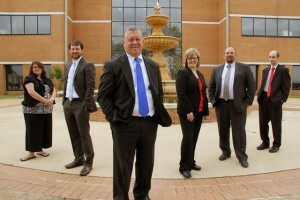 Working in the family business, Baird pursued a degree in marketing. But before graduating, he realized his gifts were better suited for the financial field, particularly personal financial planning. After graduating from SAU, he re-enrolled to finish necessary classes for the CFP exam, which he passed in 2003. Becoming a partner in Mustard Seed Financial is considered a high point in his career. Growing up in East Texas, Angela Eaves (SAU 2004) kept a part-time job throughout high school. In 1999, while working full time, she decided to return to college to get the degree in business she always wanted. She knew where to go. SAU’s College of Business was close and had the best reputation in the region. She found the retirement planning class inspiring and it held her interest. In 2004, she became a financial advisor with Mustard Seed Financial, working her way up to partner in 2011. Eaves said she is passionate about customer service. Bruce Butterfield (SAU 2004) comes from an extended family of SAU alums but waited 18 years after high school to go to college. Butterfield is now a Certified Financial Planner™ professional, a partner and manages the El Dorado office. Rounding out the staff at Mustard Seed, Zach Talley (SAU 2008) is a junior advisor and runs much of the back office operations at Mustard Seed. Jen Milam (current student at SAU) is the administrative assistant. The company name comes from the biblical description of the mustard seed, the smallest of seeds that grows into a tree the birds can nest in. That’s a good description of what can happen to an individual’s finances with proper planning. And this Mustard Seed has its roots at Southern Arkansas University!